Eyes become swollen and puffy when the eye tissue retains fluid. This fluid retention can stem from several factors, including heredity, allergies, stress, fatigue and crying. It can also be caused by alcohol consumption, dehydration or excess sodium. A combination of these factors may also be at work. Since the fluid buildup increases as you sleep, puffy eyes are more noticeable in the morning. Although there is nothing you can do to permanently get rid of swollen eyes, there are some things you can do to help relieve them. Determine if your swollen eyes are being caused by allergies, especially seasonal allergies. Besides puffy eyes, symptoms of seasonal allergies include sneezing and itchy, watery eyes. If you have these symptoms, taking an allergy medicine like Claritin or pseudoephedrine--or the generic brands--will help temporarily. If these over-the-counter medications do not help, talk to your doctor. Make some simple lifestyle changes to alleviate swollen eyes. Reduce your consumption of alcohol. Increase your daily fluid intake, which helps reduce fluid retention in the body. 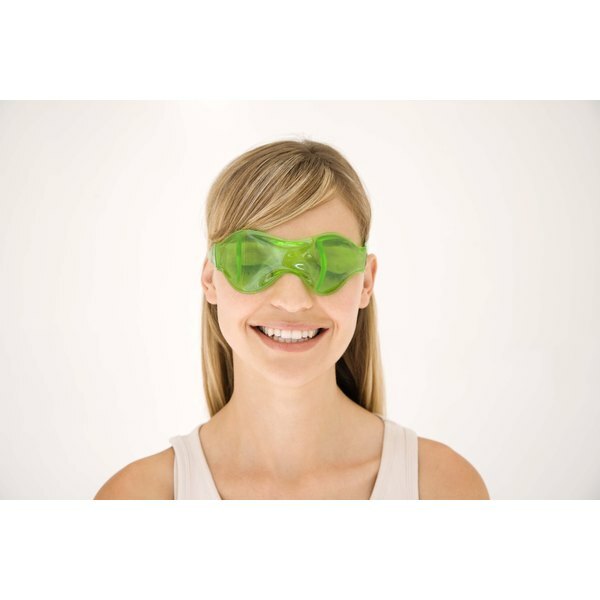 Reducing stress will help with puffy eyes. Get the proper amount of sleep; sleeping on your back with your head elevated helps the drainage of fluid from around your eye area. Try some alternative remedies. Take 2 tbsp. of organic apple-cider vinegar and 1 tbsp. of black-strap molasses twice a day. According to the Indian Child website, apple-cider vinegar has many health benefits, including improving circulation. Natural Health Care Today lists black-strap molasses as a source of Vitamin B-1, which is necessary for good eye health. Cayenne pepper is also considered a great natural remedy for sinus problems, which can affect puffiness under the eyes. Take ½ tsp. of cayenne pepper twice a day or--if that is too strong for you to swallow, take it in capsule form. Try some quick-fix remedies to help alleviate puffy eyes. Tap your fingers gently under your eyes, moving from the inside to the outside to encourage fluid drainage. Cold compresses help reduce swollen eyes; place any of the following on your eyes for several minutes. Refrigerate one of the plastic masks that are filled with gel. Placing slices of cold cucumber or cold potato on your eyes help to rehydrate and temporarily reduce puffiness. Brew tea from bags, squeeze out the water and chill the bags to use as a cold compress. Saturate cotton balls with chilled witch hazel to use as a cold compress. Freezing a metal spoon and laying it on your eyes works when you’re out of cucumbers, potatoes, tea bags and witch hazel. Use cosmetic treatments to reduce swollen eyes. Use an eye cream that is formulated to firm eye tissue. Fashion models pat small amounts of hemorrhoid ointment under their eyes to temporarily tighten the skin. Use "lightening" creams, but in small amounts; otherwise, when the lights hit the cream, it will cause the puffiness to be more noticeable and give you a "possum look."